Back in January 2012, RTÉ’s Four Live show (now discontinued) aired a jarring live interview by Maura Derrane with Niamh O’Connell about breastfeeding “older” children. I complained, and I know a lot of others did too. “And My Baby” blogger posted her complaint on her blog. Niamh herself wrote about her experience of the interview on her own blog. 9 Crow’s shop owner in Dublin was moved to publicly denounce the interview on her business blog. The show’s Facebook page received an unprecedented level of comments from upset people who found the interview offensive. “The Forum found the complaint did not raise issues which required further consideration and accordingly, the complaint is deemed resolved”. Dismissed. I shouldn’t have been surprised. I researched previous, unrelated complaints on the BAI website, and they don’t uphold too many in a given year. But the reason for rejecting this one is really strange. “this picture is absolutely disgusting and as a woman myself, I find it offensive. The older child will be jeered because of this photo“. The photo was a beautiful, candid image of Niamh tandem feeding her two young sons in her home. The comment was read out without forewarning or apology to Niamh, who was clearly taken aback. Niamh handled the interview really well, despite what I perceived as Maura’s obvious distaste with the topic, but it was uncomfortable to watch. It was apparent to me that the interview itself was conducted in a jeering manner. Not very objective. That’s why I complained, under the fairness, objectivity, and impartiality requirements of the Broadcasting Act 2009. 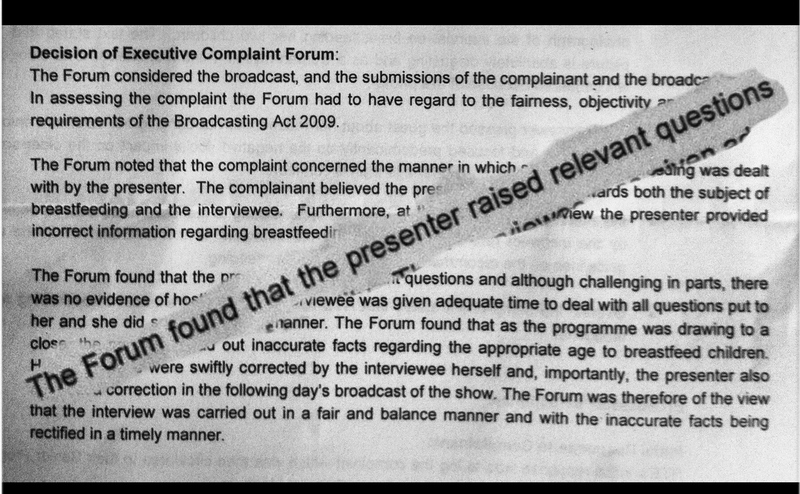 However, RTÉ and the BAI have decided that it was reasonable to challenge Niamh by reading out the above comment. According to Niamh’s blog, her husband who was backstage at the time had to cover their three-year-old’s ears when it was read out. I was glad that my young daughter, who’d been watching with me, had wandered out of the room at that point. Do you not think though that he will be jeered? This was what the BAI have found “relevant”. The word “jeer” was used a total of five times. Adults are responsible for the cultural environments and the moral compasses of children. Are the decision-makers in RTE and the BAI egging on this country’s small protegés to jeer kids that are “still” nursed? Is that what it is “relevant”? Supposing, instead, those decision-makers found some courage to over-ride their prejudices and learn something about the rights of breastfeeding women and children in this country under the Equal Status Act 2000 (Section 3.2a (gender ground) and Section 3.2c (family status ground). They could learn that the weaning age is the business of the nursing pair, not a nose-wrinkling bystander like the RTE and BAI decision-maker.They can then pass this knowledge on to this nation’s younger generations, and teach them that jeering, for any reason, is mean. Mother, yoga teacher aspirant, digital media enthusiast, archaeologist. Embracing countryside-living again after years of city lights. Still attempting, sporadically, to blog! This entry was posted in Breastfeeding. Bookmark the permalink. Thanks for your comment Niamh. I think you did an untold amount of good with this interview, despite the railroading interrogation you got. You handled it with such poise. I don’t however accept this paltry, lazy response which demonstrates a continued disengagement with the issue, and this from a state authority. Appalling. I’m completely disgusted. This adds insult to injury. When is Ireland going to grow up? Thanks for the comment Anne. The response represents a lethargy for the issues that were raised, and a repudiation of our rights by a state authority. The facts were outlined succinctly in the submissions, but I can tell they didn’t even engage. *next*! I didn’t even have time to be annoyed, I wrote my reaction so fast. But it’s sinking in now.